A ground-breaking new hospice has become the first in the UK to follow the Scandinavian-inspired ‘Sengetun’ model of care which promotes a home-from-home environment that also protects patient privacy. 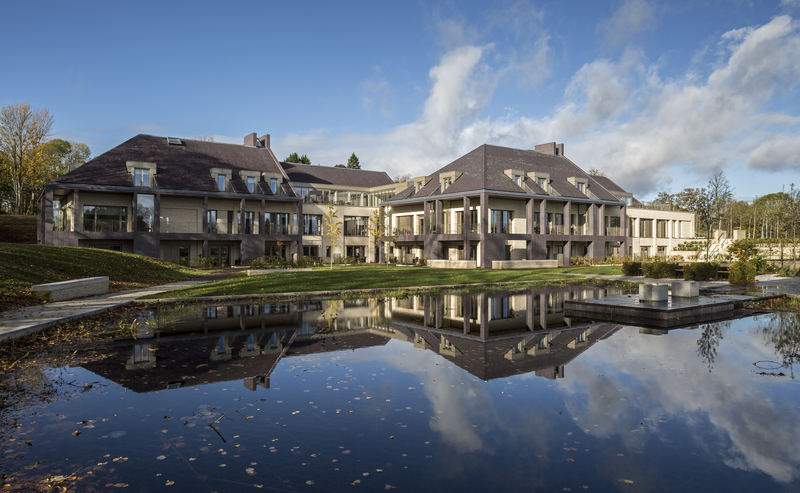 Translating as ‘bed courtyard’, the design approach is based on research that suggests the aesthetic design of a healthcare building has a measurable impact on patient wellbeing, and has been used to inform the development of the £21m Prince and Princess of Wales Hospice in Glasgow's Bellahouston Park. Designed by Ryder Architecture; the 5,840sq m building comprises a 16-bed inpatient unit, including young adults’ bedrooms; with associated support and family spaces including large kitchens, day services and outpatient units, an educational area, and administration and clinical offices over three storeys. It supports 1,200 patients and their families from a geographical area that spans Glasgow, East Renfrewshire, Cambuslang and Rutherglen, with a population of about 345,000. Set in 7.5 acres of parkland on a site gifted to the charity by Glasgow City Council; it was designed with a form that mediates between the city it serves and its parkland setting. And it enables the organisation to expand its services and offer 21st-century palliative care to young people over the age of 16 for the first time. Ryder and main contractor, Balfour Beatty, wanted to deliver a purpose-built, innovative and exemplary palliative care facility that delivers form as well as function in response to a brief which called for a warm, welcoming and non-clinical entrance and interior in a quality environment with interior and exterior materiality. This includes the use of Welsh Slate for the roofing and cladding features. Penrhyn Heather Blue Celtic grade 270mm x 180mm roof slates, specified for their aesthetics and robustness, are complemented by a cladding veneer of the same colour over a total of 1,400sq m of the outer façade layer of ‘protective' eaves and bedroom terraces. This complements the buff-coloured Petersen brickwork and bronze-coloured metal panels used on the inner layer of the façade. Projecting eaves features in the same slate are also utilised on the northern and southern gable facades to express the prominent building ends. And, in addition, Welsh Slate Penrhyn Heather Blue walling features on a large internal chimney hearth. Project architect, Alastair Forbes, explains: "The building envelope has been designed with a number of key aims in mind. The primary aim is to provide a building of dignified quality commensurate with the importance of the site and the building use, and a robust building that requires, wherever possible, minimal maintenance. "The quality of the materials proposed is critical to the success of the project and the manner in which the materials are detailed is significant in providing suitable scale and presence for the building on the site. “It has to address its context successfully, both in terms of the immediate site of Bellahouston Park and also the important Hazelwood and Dumbreck Conservation Areas which are directly adjacent." "Slate is used for the external skin of the building, which reinforces the protective nature of the building envelope. One senses the physical weight of the building on the outside at the same time as the ethereal quality of the light-filled interior spaces. These protective elements differ in density and permeability depending on the interior functions, sunlight and the site conditions. 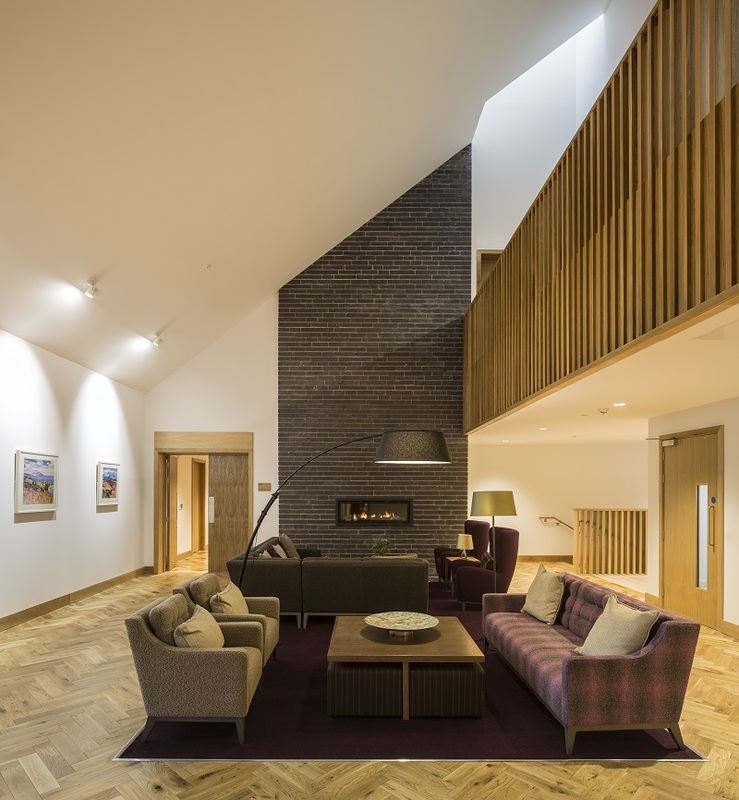 "The ‘purple/heather' tones of the Penrhyn slate were essential in linking the landscape and building interior while avoiding an overtly-dark-coloured building that would not be suitable for the building's function." The Welsh Slate roof slates were laid with 50mm x 3.35mm copper clout nails over timber sarking boards with mitred slate hips to a 38° pitch over eight months and 1,535sq m by specialist sub-contractor, Braisby Roofing; while the cladding system was devised and installed over 12 months by Stonescreen, a specialist in natural stone rainscreen systems. The company custom designed the support structure and frames to hold the slate composite panels which used Stonescreen Aerolite technology as the base. This is engineered with a combination of cellular glass reinforced with layers of glass fibre to produce a very-high-strength/low-weight substrate which is typically faced with a thin veneer of natural or artificial stone. The blocks were then cut to 20mm and foam glass material glued to each side of the slate. This was cut through the middle using a band saw and flamed. Cuts of 3mm were achieved, which made the final cladding panel 8.5mm Welsh Slate and 40mm foam glass. Stonescreen director, Gary O'Connor, said: "The design and construction of the support structure was the most-complex part of the cladding works. Attaching the cladding panels was relatively straightforward." 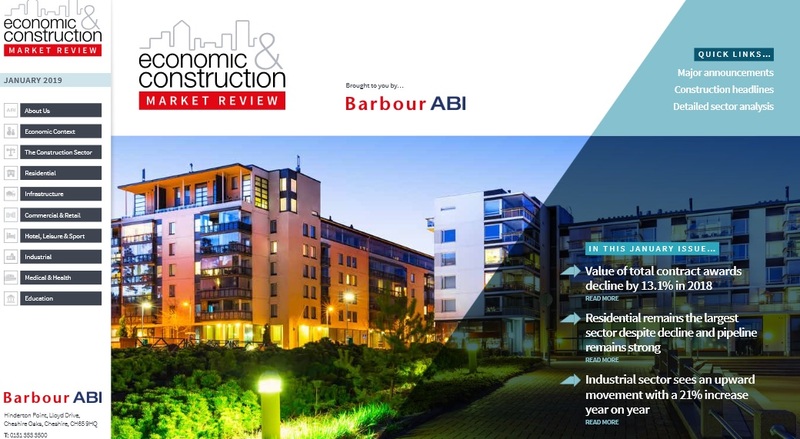 Forbes added: "The building fabric, wherever possible, has been used to enhance the environmental performance of the building, which had to demonstrate low energy use and value for money over a lifecycle costing. “The external walls and windows had to meet the standards set down in the revised Section 6 of the Scottish Building Standards, including standards for airtightness. “In the detailed specification of the materials for the building, consideration was given to green issues such as low embodied energy, responsible sourcing, and sustainability/environmental performance. And Welsh Slate commercial director, Michael Hallé, told BBH: "The cladding system used on this project is the first time a composite panel with a Welsh Slate veneer has been used. 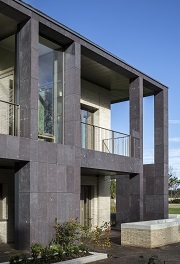 “The overall appearance of the Welsh Slate on the project is stunning and it sits beautifully within the environment."